In recent years, some studies have suggested that cranberries prevent UTIs by hindering bacteria from sticking to the walls of the urinary tract, thanks to phytochemicals known as proanthocyanidins (PACs). Yet the mechanisms by which cranberry materials may alter bacterial behaviour have not been fully understood. 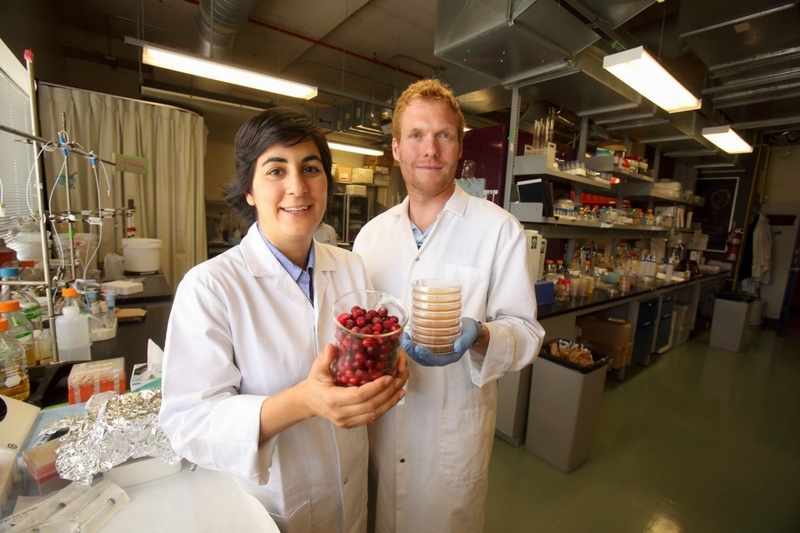 Now, researchers in McGill University’s Department of Chemical Engineering are shedding light on the biological mechanisms by which cranberries may impart protective properties against urinary tract and other infections. Two new studies, spearheaded by Prof. Nathalie Tufenkji, add to evidence of cranberries’ effects on UTI-causing bacteria. The findings also point to the potential for cranberry derivatives to be used to prevent bacterial colonization in medical devices such as catheters. In research results published online last month in the Canadian Journal of Microbiology, Prof. Tufenkji and members of her laboratory report that cranberry powder can inhibit the ability of Proteus mirabilis, a bacterium frequently implicated in complicated UTIs, to swarm on agar plates and swim within the agar. The experiments also show that increasing concentrations of cranberry powder reduce the bacteria’s production of urease, an enzyme that contributes to the virulence of infections. These results build on previous work by the McGill lab, showing that cranberry materials hinder movement of other bacteria involved in UTIs. A genome-wide analysis of an uropathogenic E. coli revealed that expression of the gene that encodes for the bacteria’s flagellar filament was decreased in the presence of cranberry PACs. The team’s findings are significant because bacterial movement is a key mechanism for the spread of infection, as infectious bacteria literally swim to disseminate in the urinary tract and to escape the host immune response. Another recent study led by Tufenkji in collaboration with McGill professor Showan Nazhat, a biomaterials expert at the Department of Mining and Materials Engineering, finds that cranberry-enriched silicone substrates impaired the spread of Proteus mirabilis. Those results, published online in the journal Colloids and Surfaces B: Biointerfaces, point to potential use for cranberry derivatives to hinder the spread of germs in implantable medical devices such as catheters, which are frequently implicated in UTIs. “Based on the demonstrated bioactivity of cranberry, its use in catheters and other medical devices could someday yield considerable benefits to patient health,” Tufenkji says. Funding for the new studies was provided by the Natural Sciences and Engineering Research Council of Canada, the Canada Research Chairs program, the Wisconsin Cranberry Board, the Cranberry Institute, the Fonds québécois de la recherche sur la nature et les technologies, and the Fonds de la recherche en santé du Québec.